CD review: "Shot in the Dark"
This review first appeared in the November, 1986 issue of Loud and Clear magazine. Sometimes when I'm listening to a particularly bad album by Bon Jovi or Eden, I wonder why I go through the agony of reviewing albums. 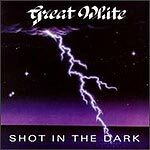 But then an album like Great White's comes along and reminds me what real balls-out hard rock can be. "Shot in the Dark" offers no let-down; it's 40 minutes of raw, energetic metal. "She Shakes Me" opens the broadside, followed by "What Do You Do For Love" and "Face the Day." This three-song run is incredible: tape it and play it in the car as you run along the No. 1 lane of the interstate at about 90 mph. Hell, if Gen. Patton had been a rock fan, he would have played this album as he blasted through the Nazis. This is blitzkrieg rock. Mark Kendall is one of the most underrated, unknown rock guitarists around. On "Face the Day," his slow intro builds cautiously and melodically before exploding. Vocalist Jack Russell sounds almost exactly like Fastway's Dave King at times, but fortunately, manages to escape from that monotonous sound on some tunes. Great White even shows some musical audacity here: a cover of Steve Winwood's "Gimme Some Lovin'" (most recently made famous by the Blues Brothers). A heavy metal version of the blues? Well, it works.